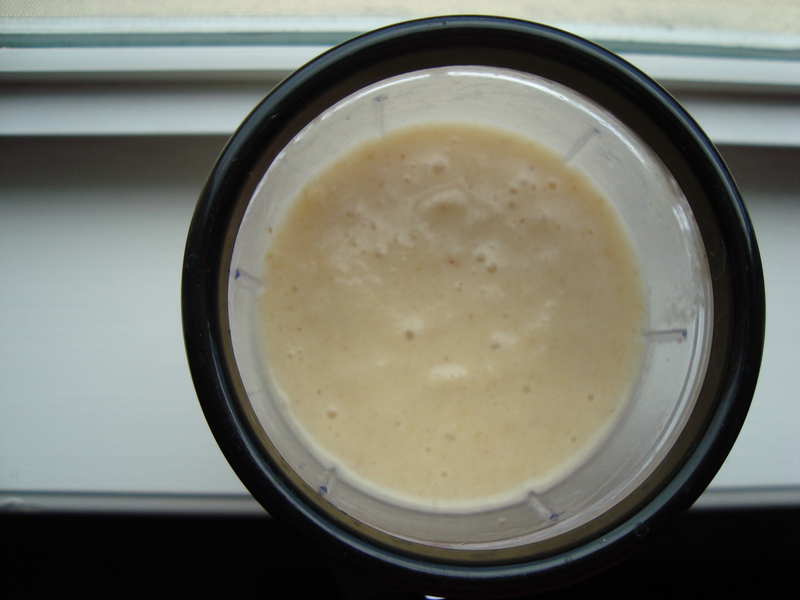 The Vegan Experiment – Day Four: All Protein Powder is Not Created Equal | Alexia Lewis R.D. I made two breakfasts on Day Four. It is rare that I make something that is inedible. Even my most crazy flavor combinations result in edible, even if unusual, dishes. This was not the case on this day. I had to toss my first breakfast. It was truly that bad. Most protein powders that I’ve used have anywhere from 16-22 grams of protein in a scoop. Since plants do not contain as much protein as the other foods used to make protein powders (whey, soy, etc. ), the amount of powder that has to be used to get to 21 grams of protein is huge. It completely overpowered my usually-delicious pumpkin pie oatmeal. I couldn’t eat it. I almost forced myself since I dread throwing away food; but I just couldn’t make myself eat it. So, here we go – food pictures! 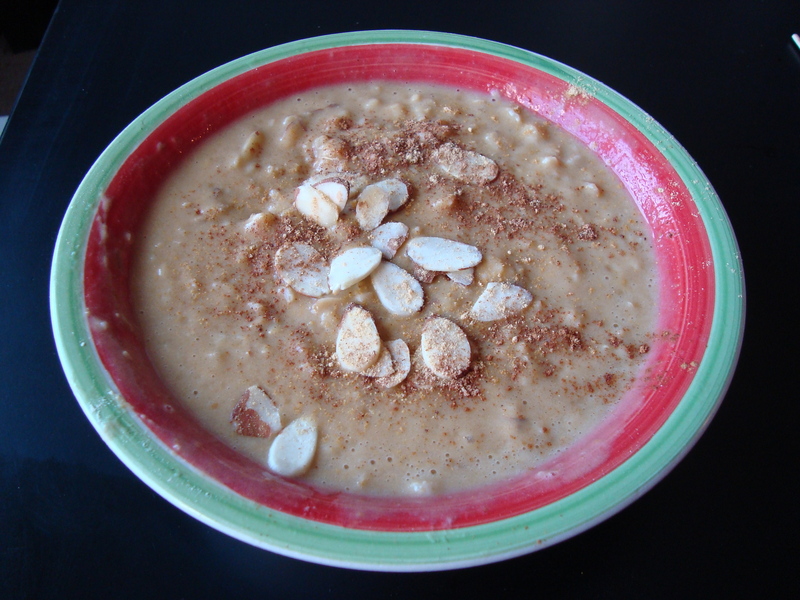 Breakfast #1: Pumpkin Pie Oatmeal – adapted from Clean Eating Magazine. 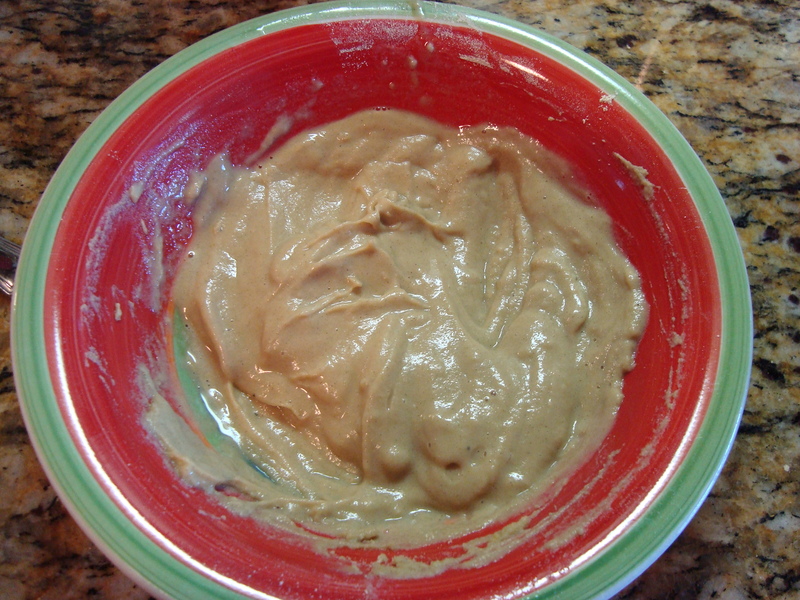 I’m sharing the recipe because if you make this with vanilla whey protein powder, it is very yummy! First, start your oatmeal on the stove by boiling 2 parts water, adding 1 part whole oats (example: 2/3 cup water and 1/3 cup oats), and then simmering until the desired consitency. While simmering, mix one scoop protein powder with a tiny bit of water and stir into a paste. You can see the plant protein powder took up half the bowl! Next take the same measuring cup you just used for measuring your oatmeal and water, and fill it half with pumpkin puree (no salt) and half with sliced almonds. If you use the same measuring cup, then you can easily adjust this recipe for any amount of oatmeal without having to do any food math! 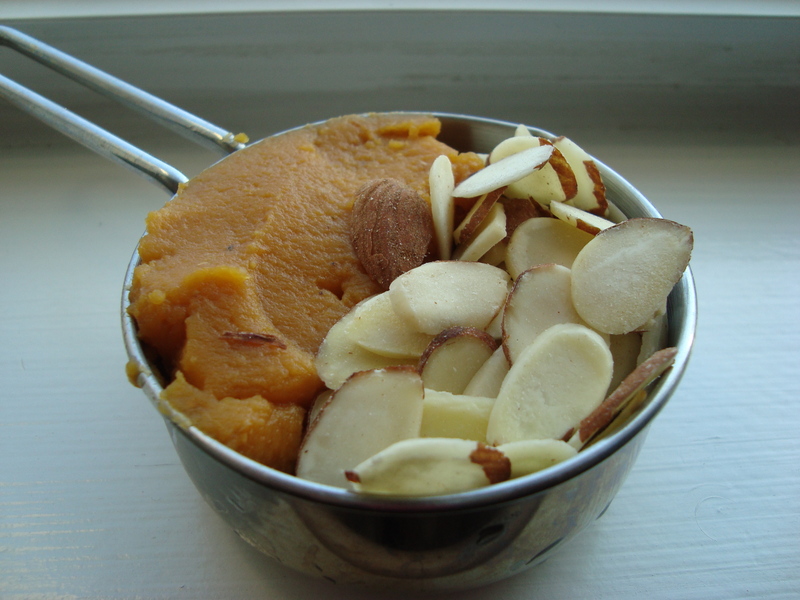 Once the oats are cooked, simply add them to the bowl with the protein powder and stir in the pumpkin and almonds. Top this with a dash of cinnamon, nutmeg, and ginger. Breakfast #2: Kashi Heart to Heart Honey Toasted Oats cereal with almond milk, sliced almonds, and raisins. Coffee with almond milk and splenda. 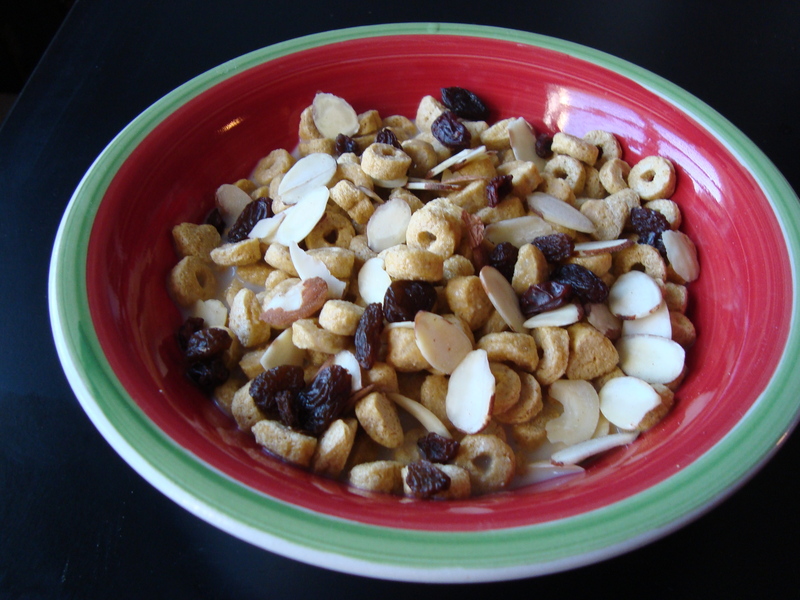 Thank you to Jason McDonald for commenting on my blog post to add nuts to cereal because it made me realize I can add some protein and fun to a basic cereal! 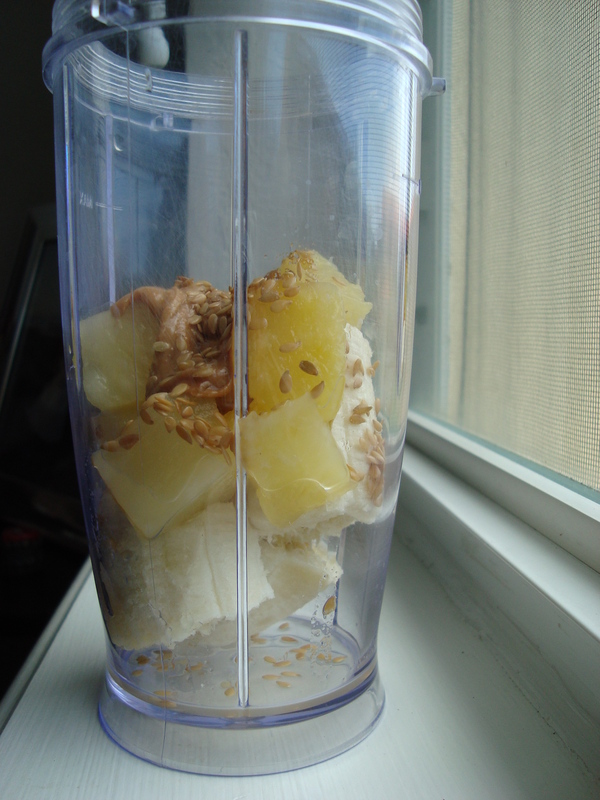 Post-workout Snack: Smoothie made with banana, pineapple, peanut butter, and flaxseed. Blend with as much ice and water as it takes to get the volume and consistency that you like. 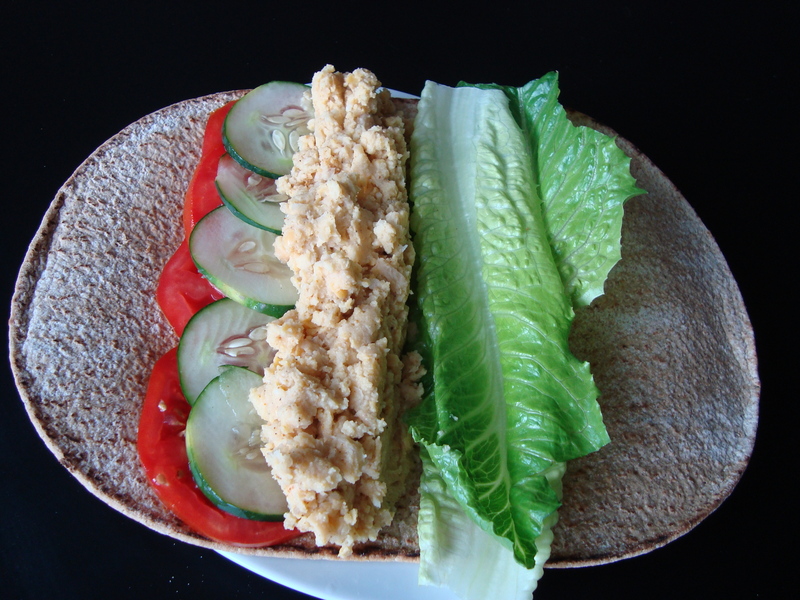 Lunch: Hummus wrap (homemade with chickpeas, olive oil, garlic, curry powder, and salt) with lettuce, tomato, and cucumber served with pretzel sticks. 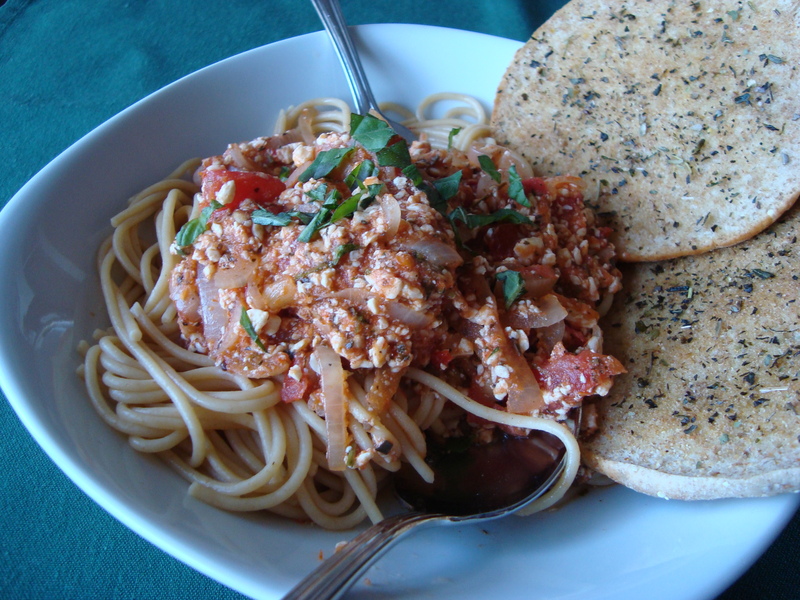 Dinner: Whole wheat spaghetti with homemade sauce of onions, tomatoes, garlic, silken tofu, marinara sauce, garlic powder, Italian seasoning, red pepper flakes, and fresh basil served with sandwich thin garlic toast (olive oil, garlic powder, and Italian seasoning). 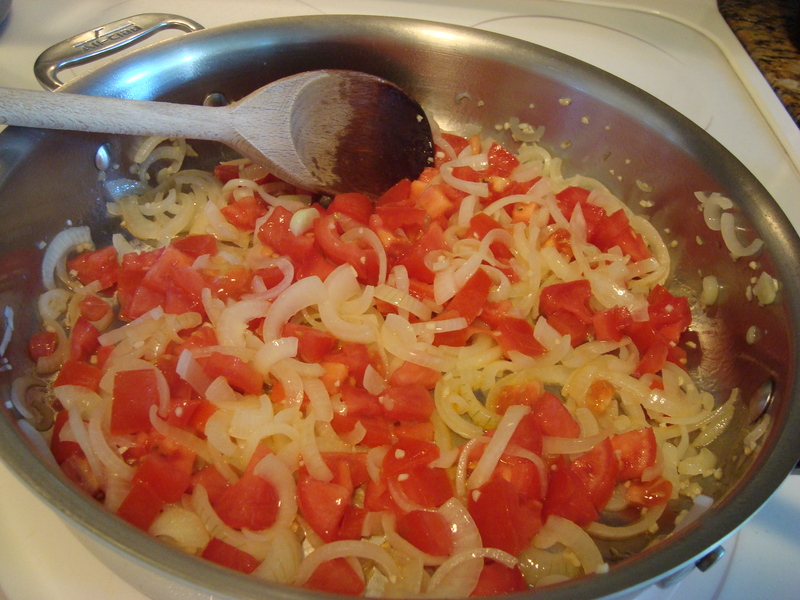 For this, I first sauted the onions then added the chopped garlic and chopped tomatoes and let those cook just a little. Then I added the marinara sauce and tofu and cooked to heat through. Last step was seasoning with the spices. It looks a little weird as a sauce due to how the tofu stirred in to the sauce in a chunky way. If I make this again, I’ll blend the sauce as a last step to make it smooth. Regardless of what it looked like, it was good! 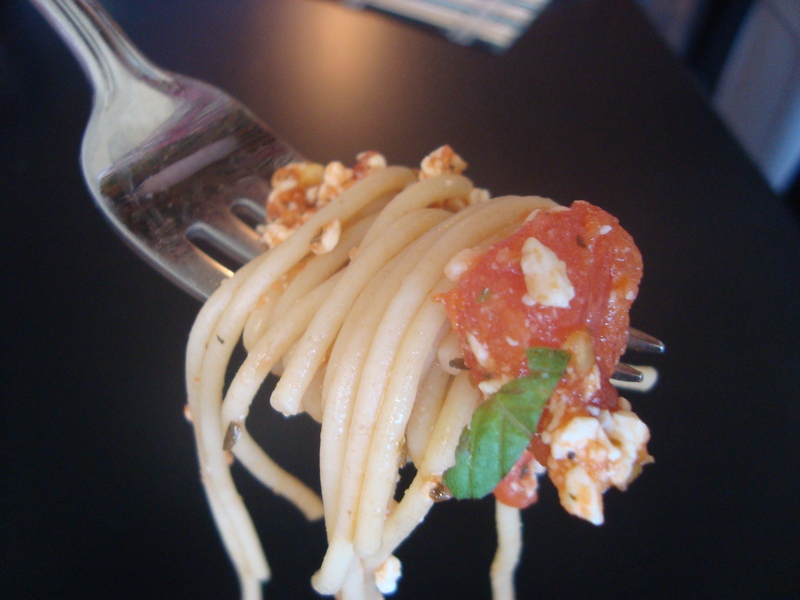 I think this was extra yummy due to the organic onions and basil from the university’s garden! In case you are wondering, I did live the vegan lifestyle for five days in a row. I’m just not the fastest blogger. It’s something I’m working on. Nutrition information: 1415 calories, 235 grams carbohydrates, 46 grams fiber, 395 grams fat, 2 grams saturated fat, 0 trans fat, 0 cholesterol, 55 grams protein, and 1360 milligrams sodium. For the daily values, my numbers were 54% calcium, 77% iron, 30% vitamin D, 36% zinc, and 250% vitamin B12. Once again, all images are my personal pictures. You may use them as long as you credit me (my name and a link back to my Web site).